With the increasing focus on sustainable living and green building, we’re often asked about solar panels and metal roofing. Does it work? Will the panels damage my metal roof, and most of all, will I have to replace the roof during the life of the solar panels? Metal residential and commercial roofs are a natural match with solar power for several reasons. Metal roofing usually eliminates the need for a drilling holes to attach solar panels. With most types of roofing, holes are drilled through the roofing material to allow a secure attachment of a solar panel. But if you have a metal roof, there’s a very good chance that clamps or other attachment systems can be used instead of holes. That eliminates concerns about leaks, rust and other damage to your roof investment. Because metal roofing has an exceptionally long lifespan, there’s very little chance that you’ll have to replace your roof before your new solar system reaches the end of its useful function. In fact, a metal roof could easily outlast a couple of generations of solar power systems. 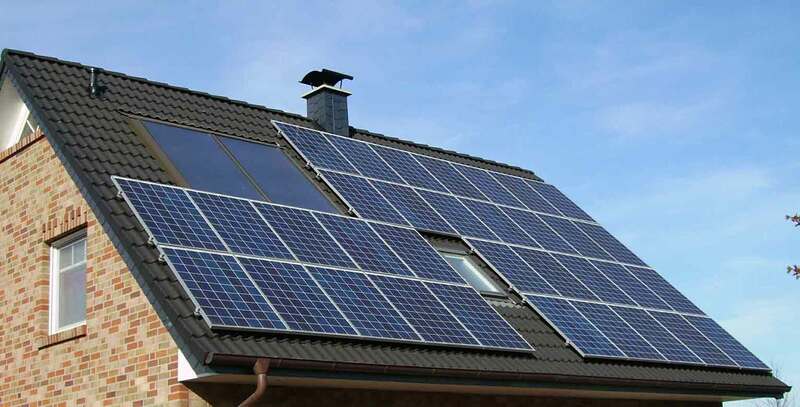 People with tile or shingle roofs are pretty much limited to silicon photovoltaic (PV) solar panels. But metal roofing also works with lower profile thin film solar. While this isn’t currently quite as energy-generating efficient as PV panels, it is less expensive and much easier to install…another potential cost savings. You’ve probably heard that metal is a great way to reduce cooling costs in your home or business — a big plus here in Central Texas! But if you add solar, you’ll actually increase that benefit because the panels or film reflect the blazing sun and shade your roof at the same time. That means lower cooling bills PLUS lower energy bills over all — a win-win! previous post: So What’s Under Your Roof? next post: Rain Like This Isn’t Your Roof’s Friend!